Picture this: your house is full of family and friends who have come to watch a sports game on your big screen TV. It could be hockey, football, baseball or even golf. It doesn’t matter what they are watching. What matters is deciding on what you should feed them. Sure, you could pass around bags of chips and that will get the job done, but not really impress anyone. 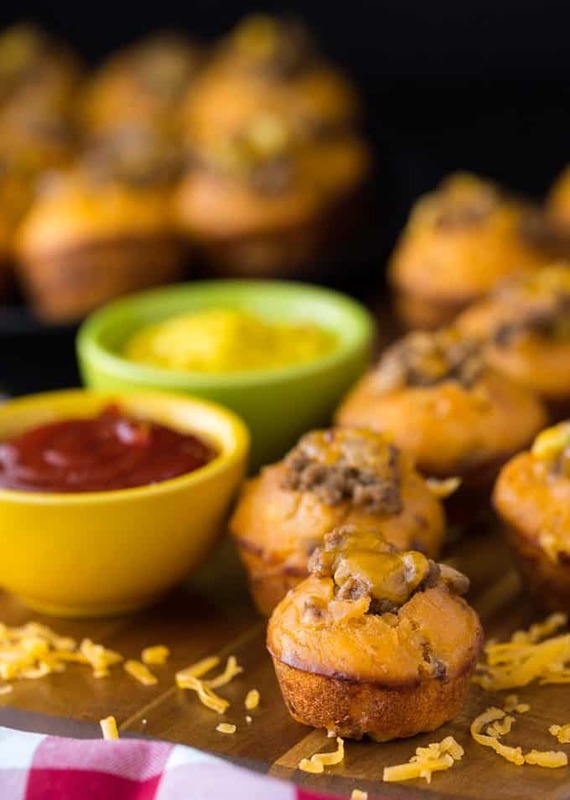 If your looking to feed a crowd with an impressive and delicious appetizer, you’re in for a real treat today with my recipe for Cheeseburger Muffins. They are exactly what you want to serve to a hungry bunch of people ready to get their Game On. To me, getting my Game On means preparing easy and tasty snacks. I like sports, mainly hockey, but what I like even better is spending time in the kitchen whipping up treats for my family and friends to enjoy. I know you’re probably thinking that making a huge batch of snacks for a crowd of people will take forever. 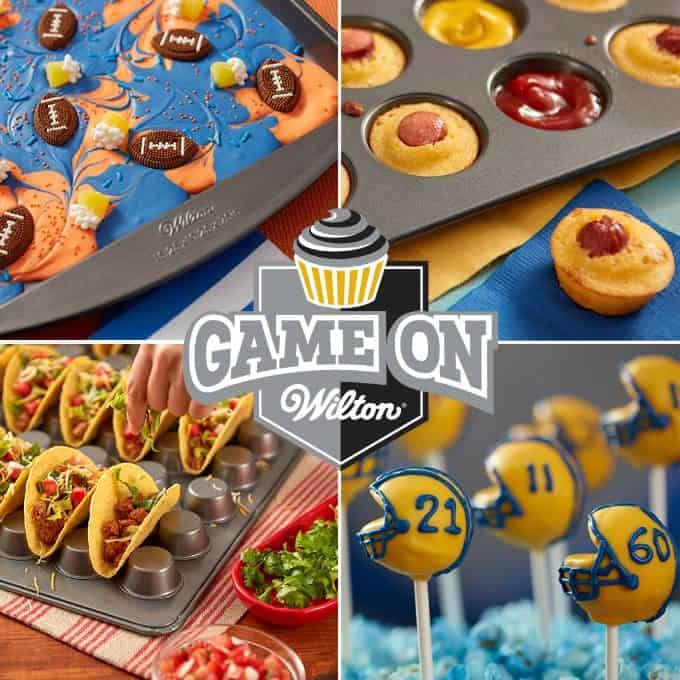 In fact, it doesn’t have to all when you use this Wilton Mega Mini Muffin Pan. 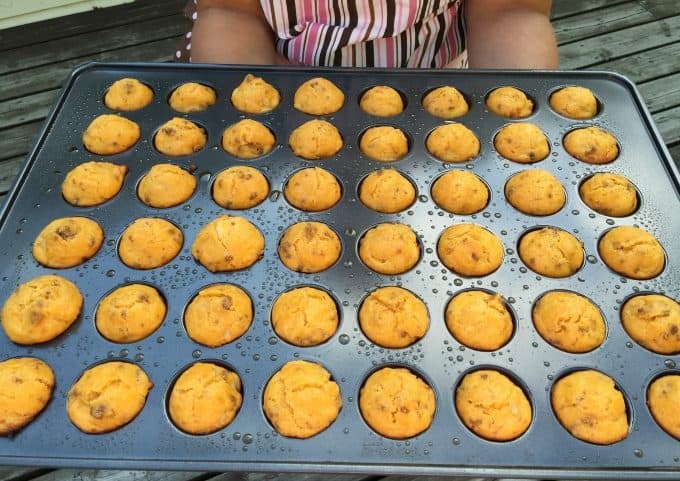 It holds 48 mini muffins so you won’t have to make multiple batches and baby-sit your oven forever. It fit perfectly in our oven and the muffins came out baked to perfection and smelled so good. My cousin helped me make them and we had to hold ourselves back from popping a couple in our mouth. The recipe has one more step and, in my opinion, is what makes it truly special. After the muffins have cooled enough for you to handle, you’re going to remove the centre with an apple corer. Be careful to not puncture the bottom. As a bonus, you can eat the little “plug” that you pull out of the muffin. It’s delish! 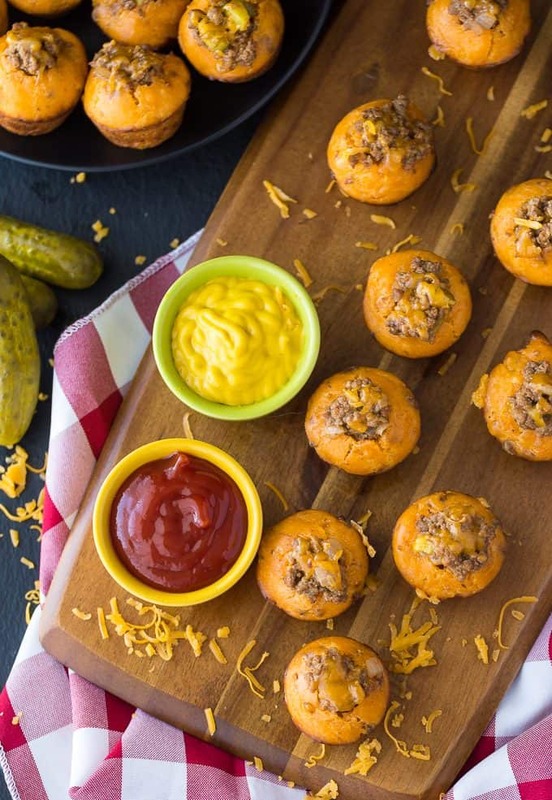 Using a small spoon, fill each muffin with a mouthwatering mixture of ground beef, ketchup, mustard and diced pickles. Finish off with a sprinkle of shredded cheddar cheese. They need to go back into your muffin pan one more time. Don’t worry – it’s only for a few minutes to heat them up and melt the cheese. They are ready to serve hot and fresh out of the oven. You can serve them with extra ketchup and mustard for dipping if you like. 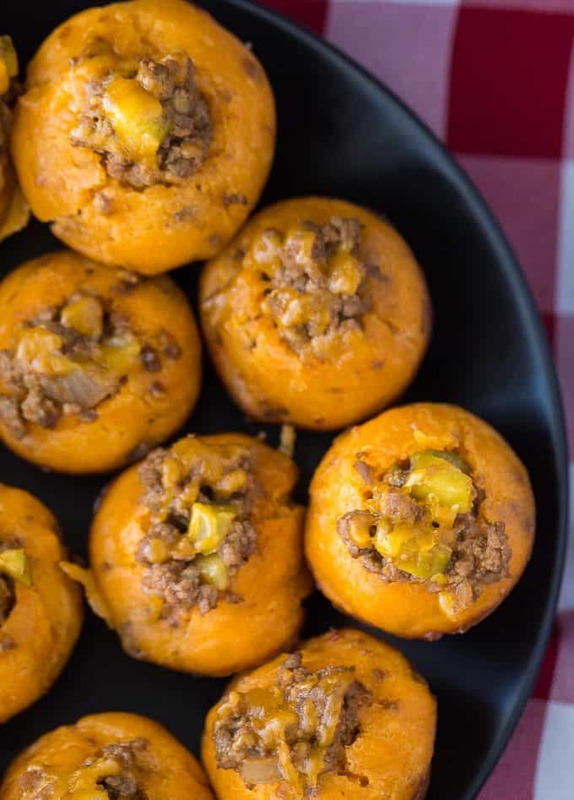 I’ll warn you now – they are seriously addicting and taste just like a cheeseburger! The beauty of this recipe is that you can customize it. Feel free to add in extra toppings into the cheeseburger mixture. 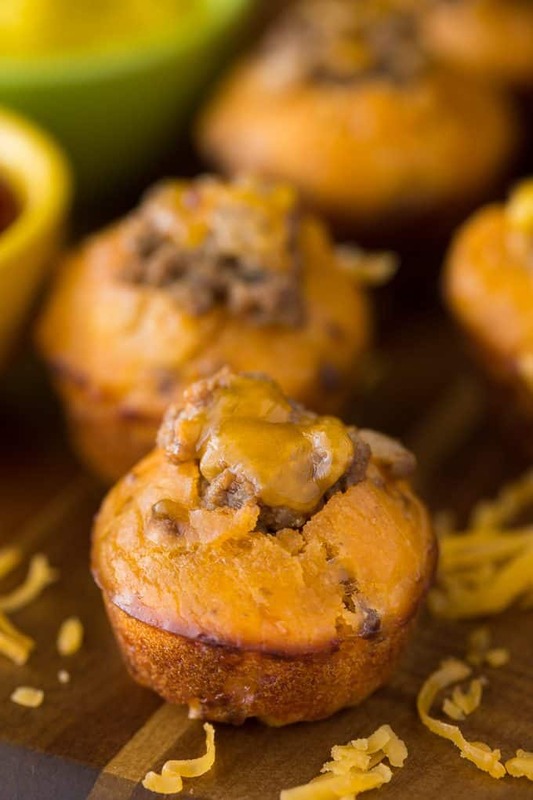 I think chopped bacon would also be delicious and then you can call them “Bacon Cheeseburger Muffins”. Your guests will think you spent hours whipping these beauties up. They won’t realize how fast they are to make. My favourite part was the cheeseburger filling. It paired perfectly with the moist, flavourful muffin. 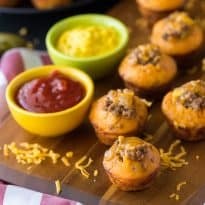 You’ll notice I added some cooked ground beef to the muffin batter. I think that takes them up a notch in terms of texture and taste. I’ve only received rave reviews from my family and friends along with multiple requests to make them again. 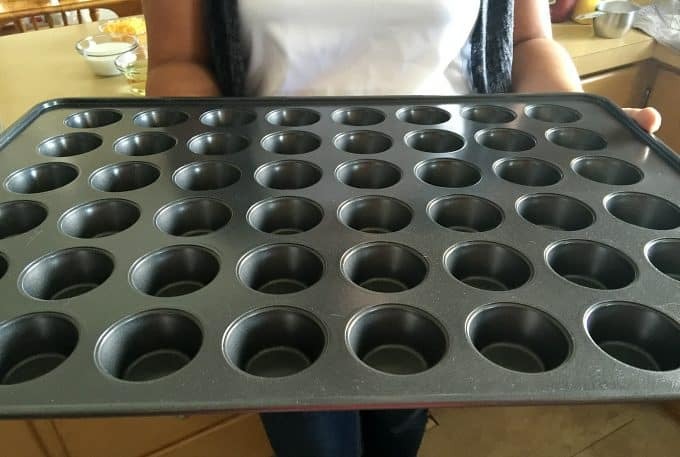 I told them they need to buy the Wilton Mega Mini Muffin Pan so they can make them at home. I’ll come over and enjoy them at their place and get my Game On! Try these easy appetizers at your next gathering. Make sure you save the recipe so that you can give it to your guests because I bet they will ask for it after they try it! You might also like this Cheeseburger Chowder. 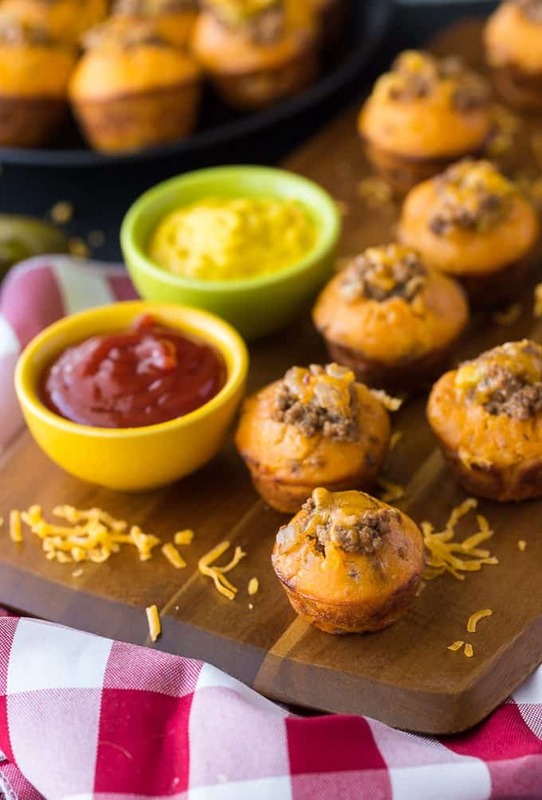 Are you ready to get your Game On with these yummy Cheeseburger Muffins? 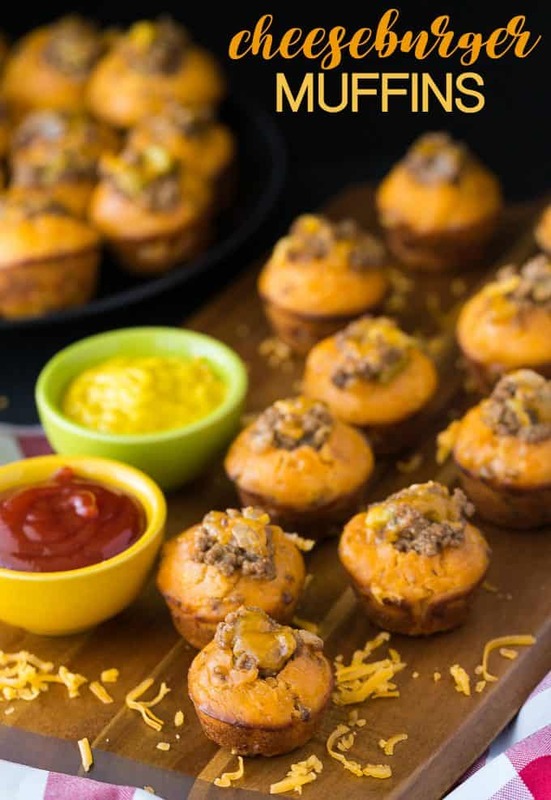 Your family and friends will love this delicious game day appetizer! It tastes just like a cheeseburger and is a real crowdpleaser. Preheat oven to 375F. 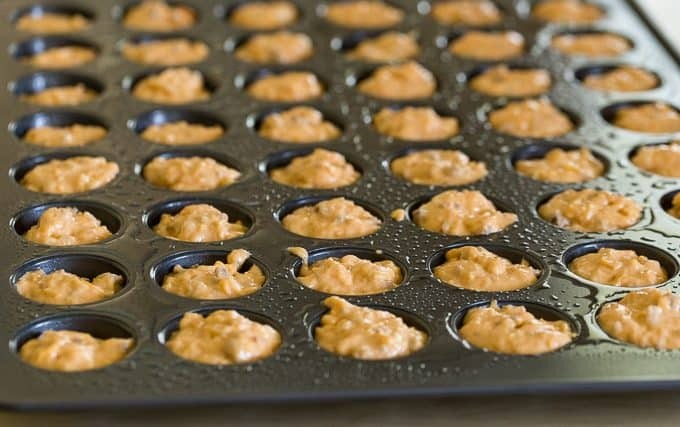 Spray a Wilton 48 cavity Mini Muffin Tin with cooking spray and set aside. Whisk flour, baking powder and salt in a large bowl. Make a well in the center. In another bowl, whisk vegetable oil, milk, eggs and pour into the large bowl’s well. Stir until moistened. Stir in 1/2 cup ketchup, 2 tbsp mustard and 1 cup cheddar cheese. Set aside. In a large skillet cook ground beef and onion over medium heat until ground beef is fully cooked and onion is softened. Add 1 cup of ground beef mixture to your batter and stir to combine. 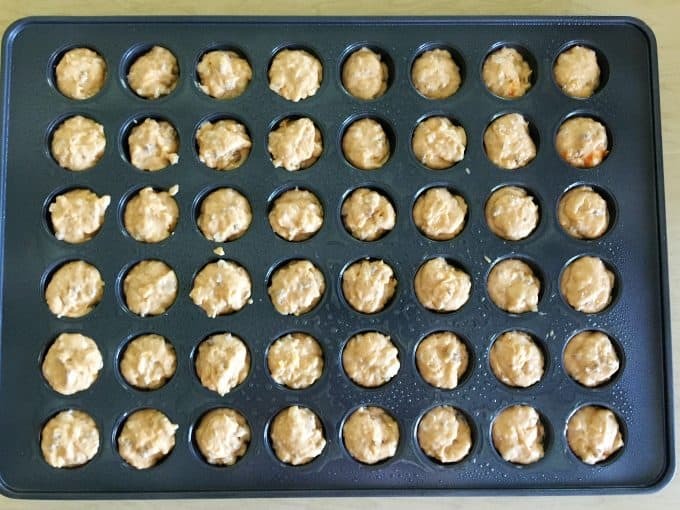 Fill muffin tin with the batter until almost full. Bake for 15 minutes or until a toothpick inserted in the center of a muffin comes out clean. 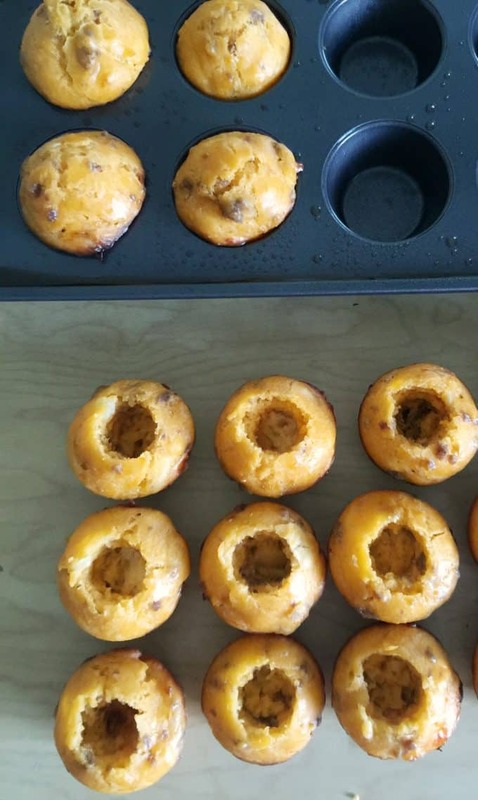 Transfer muffins to a cooling rack. Add the rest of the ground beef mixture to a small bowl. Stir in 4 1/2 tbsp ketchup, 1 tbsp mustard and dill pickles. Remove the center of each muffin with an apple corer or paring knife. Be careful to not go too deep. 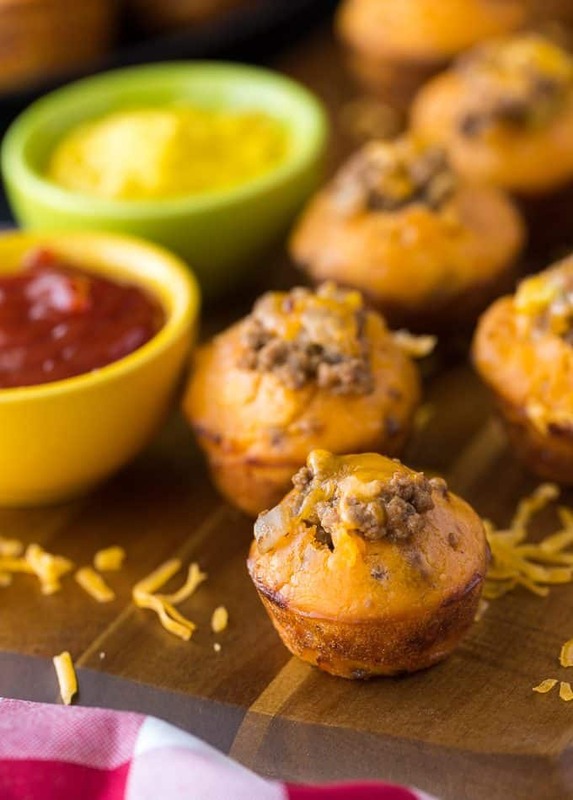 Fill each muffin with the ground beef filling using a small spoon. 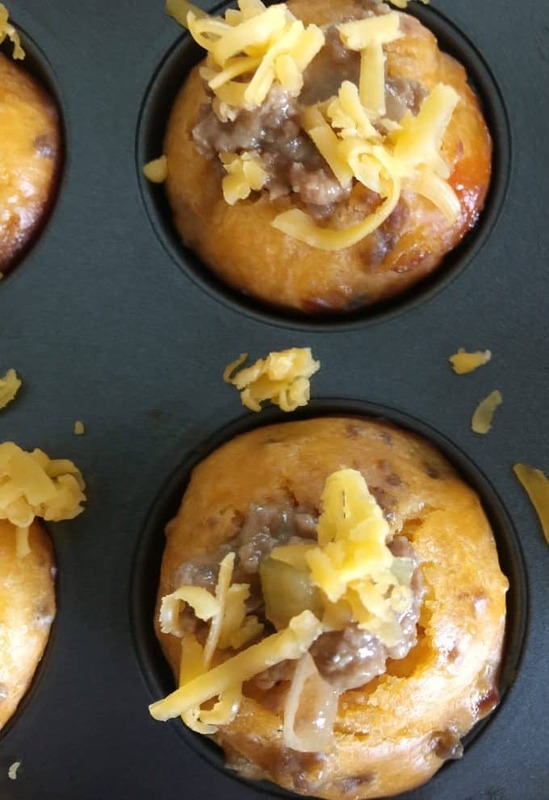 Place muffins back into the Wilton Mini Muffin Tin. Sprinkles with 1/4 cup shredded cheese. Place back into the 375F preheated oven to heat up and melt the cheese for about 3 to 4 minutes. Serve hot with ketchup and mustard for extra toppings. Visiting from the Happiness is Homemade party – this is an amazing idea!! Would love to have you join our Whats for Dinner link up! These sound delicious and they’d be awesome for busy days on the go! Great idea! These would be great for a potluck! Thanks for the recipe!! This is such a neat idea! Do you think they would work with corn meal? I think that would be just perfect! Thanks for sharing your appetizer with us at Merry Monday this week! I think that would be yummy! These look delicious! Thank you so much for joining us at Dishing It & Digging It. Hope to see you back again this week! I am going to try these over the holidays,they sure look delicious.